Loses his place when he reads? Has difficulty remembering what she just read? Has sloppy handwriting with poor spacing? Struggles in sports; can’t catch a ball, or is clumsy? 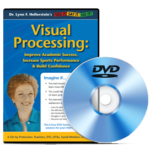 This 5.5 hour seminar (6 CDs or 4 DVDs) presents the newest vision-based solutions to help children succeed academically. Recording of Dr. Hellerstein’s live seminar – experiential and hands-on! Take this seminar in the convenience of your home or office, on your computer or digital player. What is visualization and why is it important in the learning process? 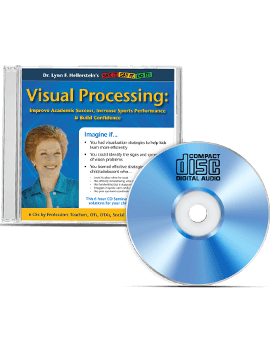 Lynn, what a pleasure and professionally great experience to hear from you about visualization! We have heard nothing but fantastic comments from all attendees-those very experienced to those new in the field! I am running out of exclamation points! I loved how you integrated humor, the comics, personal experience and professional experiences. You were extremely helpful in visualizing what you were saying. The results of your program will benefit Lenski students for years to come.